biggest influence on recording standards. Marantz Professional Solid State Recorder PMD671 and Rode NT4 Condensor Microphone. Rode Blimp microphone mounting. 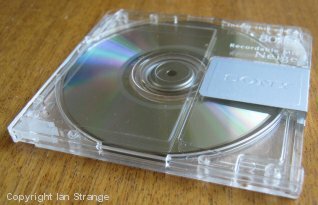 Solid state sound recording eliminates discs, tapes and any kind of mechanical system, and permits digital recording at higher definitions than standard CD quality, to allow for later editing/enhancemant without losing quality. Recordings are made onto compact flash cards which are used only as temporary storage, before transfering recordings directly to computer as WAV files. The NT4 microphone by Rode is ideally suited both for on-location recording and to the Marantz recorder. This might sound like an obvious approach, but some online user reviews of the recorder have been done without even following the maker's instructions. The PMD671 requires a mic. of high sensitivity, which almost certainly means a condensor mic. of some kind. An important issue to consider when choosing a recording machine, is the quality of the microphone pre-amps built in. These have a big influence on the level of noise (hiss) on the recordings. Again, reviews have unfairly criticised this recorder due to using the wrong mics. Also the signal/noise ratio that Marantz quotes for its mic. inputs are very honest figures, while some makers quote numbers that just look better (i.e. You want figures that relate to recording very quiet sounds such as a distant train). 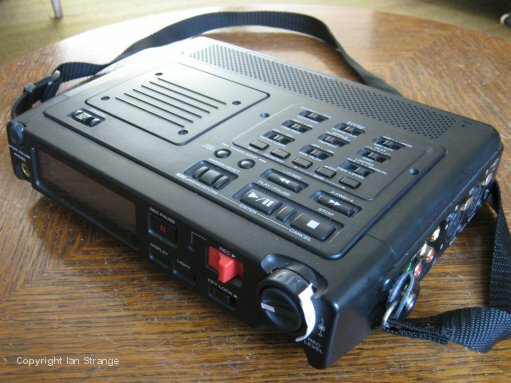 Generally, the more expensive and professional the recorder, the better the mic. pre-amps tend to be. For an intelligent assessment of recorders, you should check out wildlife recording groups such as the Wildlife Sound Recording Society. The basic quality of digital recording is indicated by the sampling frequency and bit-rate. For CDs this is normally 44.1KHz and 16 bits respectively. I record at 88.2KHz and 24 bits. Again, there has been criticism from ill-informed reviewers over the value of higher bit-rates. That is because it's overlooked that there is more than one reason for choosing a suitable bit-rate. Primarily, the number of bits sets the dynamic range, i.e. the range from the quietest to the loudest sound. Every extra bit doubles the sound, increasing it by 6dB, and 16 bits is considered adequate to cope with the human hearing range. The microphone inputs also can't handle much larger ranges. But more than 16 bits is also useful for increasing the definition of the digital signal ready for later processing. This reduces distortion when processing and is why digital processors tend to work in high bit rates. Such as analogue-to-digital convertors, mini-disc compression, and PC sound software. Higher bit-rates can also be used as a way of reducing noise by keeping the sound in the higher bits, and dropping the lower (noise carrying) bits afterwards. A higher sampling frequency also takes certain types of digital distortion up out of hearing range. I use 88.2KHz because it divides neatly into the 44.1KHz for the final CDs. One's choice of recorder also comes down to simpler practical issues such as the switches and their ease of use. Pocket sized recorders with fiddly multi-function buttons can be a nightmare to use out in the field, especially at night. A more bulky professional machine tends to have old fashioned switches that can be used by feel and respond instantly. Modern press-buttons tend to have time-delays built in to them. It is also important to buy a recorder that has manual record level control. Pocket machines tend to have only digital level control, rather than one at the analogue input stage. The PMD671 has a limiter option to automatically reduce peak levels to avoid overload distortion. For most railway recording, it is best to switch this off (and keep the level control set low) partly because the limiter adds extra noise. I've actually found that the limiter can cause distortion with sudden peaks in very loud sounds, while switching it off (and being careful to adjust the record level control) avoids this problem. One downside to this, and other, solid state recorders is the batteries. Battery life on some professional machines is rather short, and on the PMD671, about 3 hours is a realistic figure for a busy day's recording. Whatever life manufacturers quote, I always halve the figure! The PMD671 uses 8 AA batteries in a holder, and so this means a high risk of a bad contact losing power. Be sure to spin the batteries in their holder, and insert/remove the holder repeatedly to clean the contacts by friction. Alternatively, purchase the expensive battery specially made for the machine which can be recharged in-situ. Be careful with your choice of compact flash cards. Not all brands are compatible with this machine, and some cheap ones listed as compatible don't always work well. I use "Sandisk" cards, and you don't need the super-duper fast and expensive versions. There is also some confusion over the maximum size of card that one can use. From the literature and specifications, it appears that 4GB is the largest card. The instructions hint that larger cards would work. Some user feedback stated that this is true, but that the remaining record time indication gives a false reading, as though a 4GB card was in use, if you were to use an 8GB card. My own experience is that an 8GB will only take 4GB worth of recordings. 4GB equates to about 2 hours in 88Khz/24 bit, or about 6 hours in CD quality. One minor snag with the Marantz machine is that the record level knob turns too freely, and is easy to nudge off its desired setting. So I wedge some card alongside it to stiffen it. This white card is visible in the photo. I also stuck a white marker onto the record level knob to make it easy to see which way it is pointing. There are plenty of other good makes to choose from such as Fostex and Edirol. The Rode NT4 microphone has professional quality at a more modest cost. It's most noticeable characteristic is that it picks up the sub-bass rumble of a heavy train (or the rumble of an English Electric 4 stroke), and this can be felt at home as the floor and air vibrate. That completes the feeling of "being there", rather than just your ears being there! A microphone needs a suitable mounting to avoid handling noise and wind buffeting. Usually this means elastic band suspension to cut out unwanted vibration. For reducing wind noise, the foam shields that come with mics are totally inadequate. Furry "wind-jammer" covers help, but still don't cope with very breezy weather. 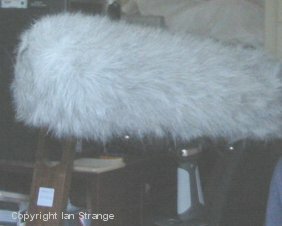 Ideally a larger sausage shaped mounting that provides a space of still air around the mic, and then a furry cover over the mounting. Rode provide their "Blimp" mounting with the "Dead Wombat" furry cover. This mounting system is about half the price of similar Rycote mountings and does not stand as much rough handling, but is quite adequate for our needs. The main problem is the sheer size (20 inches long) and weight of this set-up, which will not appeal to the casual recordist! The Dead Wombat comes with its own hair brush and instructions on how to "extend the life" of your Dead Wombat! Our Australian friends have a keen sense of humour. There is one minor problem using the Rode Blimp with the NT4 mic. The Blimp comes with a tail-lead installed with its trailing connector built into the Blimp handle. This lead is mono, since most microphone suspension systems are used with mono mics. It is designed so that you can remove the tail-lead and thread your stereo lead through the handle (secured from movement by a bung). The problem is that the leads supplied with the NT4 have octagonal shaped connectors which won't go through the Blimp handle. It's only the plastic part that is so shaped, and the solution is to file it into a circle. In fact, I was already using a different lead that has conventional round connectors, but the lead itself is thick and won't fit with the bung into the handle. So I ommit the bung and cram fabric into the hole to keep the lead from rattling around. It is essential to be sure that the lead does not create unwanted noise by knocking against anything. I purchased that lead because the original one supplied is a bit long (3 metres), and the replacement (ordered from an ebay seller and custom-made) turned out to be top quality. Sadly, the seller ceased doing this service. This was the best thing in recording to appear since magnetic tape was conceived, but was subjected to over-whelming criticism from 'experts' and observors alike. It also failed due to poor marketing by certain makers, thus ruining the superb work of the original design engineers. Mini-discs are contained in cartridges similar to floppy-discs. They are re-recordable, like magnetic tape, but can be easily edited with seemless joins and are loaded with clever features and characteristics. The discs are more reliable than recordable CDs. **Data is stored by a combination of heating with a laser and magnetism, making it a more reliable and durable storage medium. **Data is arranged in a random access system, much like a floppy-disc or a hard-drive. In practice, that means that you can edit, delete, and then re-use any part of the disc. This is done automatically, as the recorder finds empty spaces. It even skips sectors with defects and you don't notice the join in the recording. **The protective cartridge means few worries about scratches and dirt making your discs jump. **You can write titles on the disc table of contents for easy navigation of the disc. **Portable recorders are truly pocket-sized. **Both home decks and portable recorders are temperamental and each have their own quirks. At least that is true of 1990s built machines that I have. Presumably this state of affairs would have improved with further development. **An idiotic attempt at reducing piracy actually hampered legitimate home publishers. Discs were encoded to prevent two generations of digital copies being made. This actually stopped recordists from publishing their own material. This system was also used on recordable CDs. **If you take advantage of the convenience of pocket sized MD recorders, you end up with poor quality mic pre-amps. These not only create a certain amount of hiss, but also lose some of the bass response. However, this trouble can be rectified. See below. The criticism levelled at mini-discs centred on the compression of the data involved in squeezing it onto a small disc. This is a classic example of how discussion on quality dwells on complex technical issues that make little or no perceptible difference, while largely ignoring issues that heavily influence recordings. As with so many developments, it improved in leaps and bounds, and so anyone who heard early versions, were probably not impressed! By the late 1990s, the quality had reached a very high level. I tested it by trying multiple generation re-recordings of one of my best recordings, and using excellent monitor headphones, and reached the 9th generation before very slight degradation was noticed. Sharp MD-MS702H and then a Sharp MD-MT888H. Marantz EM8 stereo mic and then a Sony ECM-MS957 stereo mic. Felmic Amps FEL 3.5 SX5 mic pre-amplifier. MD provided a step up in crisp sound quality over cassette-tape, but the pocket sized machines still generated a slight hiss and also lacked bass response. The solution is the addition of a microphone pre-amplifier, but most such units are more bulky than the MD machine and require their own batteries. The answer came from FEL Communications. They do mic pre-amps built into the microphone plugs and taking power from the recording machine. I bought a lead for my Sony mic with the pre-amp built in and this dramatically cut the level of hiss and also restored the bass response. As it raises the record level substantially, one has to be careful not to overload the mic input on the MD recorder. Overload is most likely from a Deltic at low revs, and so it is not recommended for on-train recording or at close quarters alongside a Deltic. Marantz CP230 Stereo Cassette Deck. Realistic 33-919A Stereo Electret Mic and then Marantz EM8 Stereo Mic. The Marantz CP230 cassette recorder is a professional piece of kit designed for on-location recording. It retains proper old-fashioned controls that are practical to use, such as mechanical keys, and traditional level meters. The quality of more modern cassette tape decks is remarkable when you consider how precise the mechanism has to be. And the mechanism was a source of trouble, but primative repairs could do the job, such as packing under the cassette to keep it at 90 degrees to the capstan drive. This 'repair' eliminated the problem of tapes drifting from side to side. Cassette recordings sound rather hissy (even with noise reduction systems) by 21st century standards, but this can be greatly reduced using Pioneer's digital noise reduction (similar in principal to dynamic noise reduction systems). The "Realistic" mic used at one time might not sound like the last word in professional quality, but it was surprisingly good. In fact it was used for my absolutely amazing Vulcan bomber recordings in the early 1990s, and survived the deafening sounds. In my early recording days, finances did not permit stereo hi-fi equipment. At the time it seemed a pity, as I captured historic and sometimes exciting sounds, and never expected to be able to publish them. However, over the years I worked on ideas to enhance, restore, and add a stereo effect. It took a few more years before digital equipment became available that allowed me to put my ideas into practice and give my old recordings a totally new lease of life. See below for more details about post-production. When I was preparing to publish a range of CDs back in 1999/2000, I had a few problems. The first one was editing and enhancing my digital MD recordings, while keeping them in the digital domain. An added setback was the copy-protect code in the discs that prevented a 2nd generation copy from being made digitally. I knew that digital equalisers were used by professionals and managed to get hold of a newly available machine, the Behringer Ultra-Curve Pro. This works in the professional format for the code (AES) for its input and output, differing from the SPDIF code used for domestic machines such as MDs and CD players. So I also got myself a Behringer Ultramatch which is a digital converter. It also happens to strip out that infruriating copy-protect code. This set-up allowed me to enhance MD recordings in the same way that one works on old tape recordings. There was a second important use for the digital equaliser (actually, it's more than an equaliser, effectively being a full processing machine equivalent to a lot of PC software that has since become more readily available): I was able to enhance my old archive mono recordings to a level that I was satisfied with, and also experiment with ideas for creating a pseudo-stereo effect (still a trade secret!). It takes a lot of time to improve some recordings, but the results are quite dramatic. One can't make them the equal of professional stereo recordings (let alone modern digital recordings), yet they are still impressive to modern-day ears. As an enthusiast, I know how to get the best 'feel' for great sounding recordings, whereas professional sound studio staff are unlikely to have the required sympathy for the subject. An extra bonus came in the form of Pioneer's digital noise reduction fitted to their MD decks and also to some of their tape decks. Later versions of this (from 1999) cut out most tape hiss at the flick of a switch, and only rarely degrading the sound. This works far better than PC software I have tried. It has transformed my later stereo tape recordings. I don't always use it on old mono recordings which have more hiss and less high frequency sound, as occasionally some degradation of sound occurs when the noise reduction is used. These old recordings respond better to simple equalisation or a combination of both. The Behringer machine mentioned above is effectively a computer processor with a more user-friendly interface than one gets on a monitor with sound software. It also has the advantage that one is re-recording in real-time and can manually vary settings as the recording progresses, fading between different settings. I've gradually switched to doing more and more processing work on computer using Adobe Audition software. This is most useful for precision editing and for doing various processes very fast. With my latest digital recordings, they are stored on computer anyway, ready for working on (not that they need much work! ).